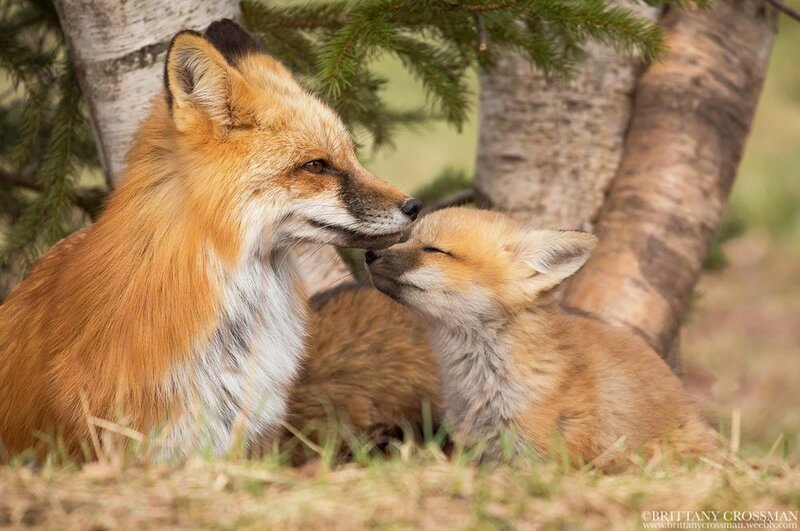 Spring isn’t just a great time to photograph foxes because they have kits, but because its also a great time to make observations about family dynamics. During other seasons, these observations are difficult to make since foxes are typically solitary animals, hunting and feeding on their own. Fox families are interesting for many reasons, their roles from fox to fox can defer sometimes drastically. Red foxes sometimes invite a non-breeding female (usually one of their kits from the previous year) to help raise their new litter. Two of the four dens I have been following this year have had a “helper fox”. The role of this non-breeding vixen is to protect, feed, groom and play with the kits. One den in particular, the helper seems to play a bigger role in the lives of the kits than their father (dog). I have yet to see the male bring back food or even play with his kits. However, he does stay out in the field on guard. The helper fox frequently brings back meals, plays, and grooms this den of 5. Some speculate that the role of being a helper provides good practice for when that vixen has kits of her own in the future. Let’s talk about the wildlife in our backyards. I’m going to get straight to the point. I want to talk about the responsibilities we have to the wildlife with whom we share our immediate surroundings. Yes, I mean the raccoons we hear arguing in our back gardens at night, and the opossums playing dead in our accidentally open trash cans outside, and the ghostly red streak we see shooting in front of our car as we drive home on a dark evening (that we somehow know is a fox), and the coyotes singing us serenades at twilight. I hear people often express in exasperated voices how they cannot believe they are seeing foxes or “so many” raccoons in their neighborhood. They can’t believe they live in a city and feel these animals should not be there - in the city - as well. They would rather see those wild animals in the woods where they “belong” - as if cities have always been here and these wild animals are encroaching on us, with their trees and forests. There is a disconnect in such statements. I think it comes from just not knowing the facts or from blindly believing untruths that were passed down over the years. I am mostly optimistic and feel that if people are exposed to the facts, they will see the flaws in those statements. The first truth I want to discuss (as far as the United States is concerned) is this: the four animals mentioned above have actually benefitted from human expansion, and there are reasons they will hang around the edges, in suburbs, in small towns, and in large cities. They are even labeled "edge species", and for good reason. They learned early on that our villages, towns, and large cities provide a lot of food via our trash and the rodents that are drawn to it. That is a fact and not much is going to change that. We’ve inadvertently produced perfect conditions for these edge species to thrive! Another fact is that removing a wild animal from a suburban or urban area, whether a single raccoon or ten raccoons, or a whole fox family, does not solve anything. What actually happens when a trapper removes an animal? Well, with his trap and animal in hand, he leaves your property and has also left a vacancy for another individual animal to occupy. If the local population of that species is healthy, another individual will fill that vacancy, sometimes overnight but certainly sooner or later. Therefore, it’s only a matter of time before you’ll notice another “pesky” critter that will “need” to be removed. Rinse and repeat. Some people may not care much about where the wild animals they have had removed from their properties end up, but I’m sure most do to some degree. Some people may turn a blind eye and just tell themselves it was released in the woods miles away and that all is ok. After all, ignorance is bliss. But, you need to know that is rarely the case. For instance, in some states if a coyote is trapped, the trapper has only two legal choices: euthanize it, or, if he has the proper permits, sell it to a coyote pen operation. It’s often the same for red foxes. I hear the going rate is a hundred dollars a head where I live. So, the trapper can euthanize the coyote and get nothing in return or for a hundred bucks, he can sell a coyote to a person who will put it in a penned-in property, where it will be chased and terrorized by competing hunting dogs with no place to hide and no way to escape. These competitions can last days. The coyotes and foxes will be ran to such exhaustion that they will often give up after a few hours, too tired to run anymore. At that point, the hunting dogs are more able to kill the exhausted coyote or fox (although not legally-but can you imagine trying to call off dogs from a target that is helpless in front of them?). In other words, these animals are possibly doomed to a cruel and grisly death, or at the very least a tormented existence. Maybe now you “get it”, but you still aren’t so keen with the idea of foxes or coyotes in your yard or garden. You may be wondering what one can do humanely to discourage wild canids from visiting their yards and gardens. Heck, you may be on the opposite end of the spectrum and wonder what you can do to encourage nightly visits from our wild friends (I’ll give you a hint: it is NEVER to feed them). So, let’s talk about what one can do to encourage or discourage wildlife from one’s property, and do so in ethical and humane ways that won’t upset your neighbors, as some may likely share your same views, but some will also have differing opinions. How can we all coexist with the least amount of conflict? In the United States there’s a reason we see ‘DO NOT FEED THE WILDLIFE’ signs in city parks, on nature trails, and in national parks. For starters, feeding wildlife causes animals to lose their natural fear of humans. Although this may be fun for you, it is ultimately a selfish act. Is your feeding habit inadvertently putting the animal in danger? Are you causing these animals to cross roads they wouldn’t need to cross otherwise so they can have a tasty treat in your yard? How do your neighbors feel about them? There will likely be some neighbors who are not so keen on having wild animals in their yards, or the leftover food cached in their gardens. The same neighbor or, maybe another one, might get frightened by a wild animal that approaches them for a handout, because it will begin to associate humans with food. Often, feeding wildlife ends badly for the animal and can make a naturally elusive animal one that is a brazen nuisance. I’ve heard all too many times the story of the disgruntled neighbor calling animal control to have the “nuisance” animal removed. Some may even leave poison out, which then endangers all animals, not just the target animal. I recently heard a story of a man in a neighborhood, only 20 minutes away from where I live, shooting coyotes out his bathroom window after he lured them to his yard with raw meat. If food is overly plentiful due to “supplemental” feedings from humans, animals like foxes and coyotes will not disperse as they normally would in the late summer and early fall in the wild. This can cause a larger population density in a smaller area, which can result in injuries, sometimes even death, as they fight over food and territory. It also increases the likelihood of transmission of disease due to unnatural crowding. Diseases, viruses and parasites can easily and quickly spread from animal to animal as they gather to feed in abnormally crowded conditions. 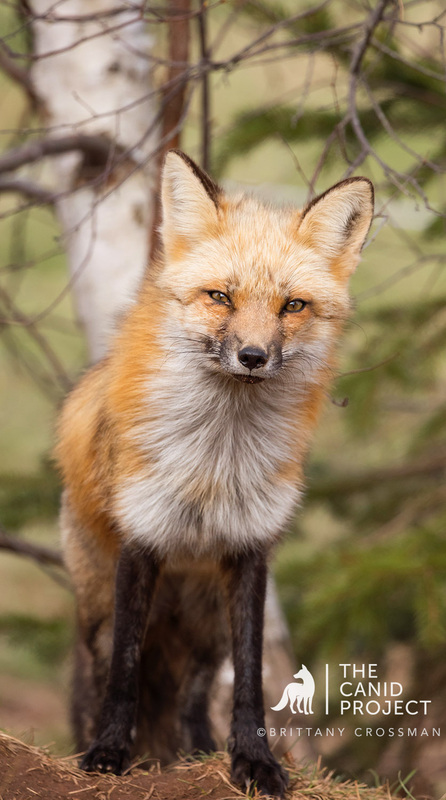 If you are feeding a fox, then you are also likely attracting feral cats, raccoons, opossums, rats, etc. Feeding wild animals from cars makes them less scared of vehicles, which just increases the chances for them to be hurt or killed in a collision. Last, they don’t need us! Enjoy wildlife from a distance. It’s much more rewarding to observe them in their natural behavioral state. Perhaps try your hand at wildlife photography or get some binoculars. Do not use rodent poison or traps! You can kill or hurt other wildlife or roaming pets in the process. Keep your trash cans closed. Rinse all cans and food containers going into recycle bins. Feed and water your pets inside and do not leave pet food or water outside. Keep your compost in closed bins. Remove fallen fruit from the ground. Repair broken floorboards on porches and close up openings that lead under the house or sheds. Keep your pets inside and do not let them roam off leash. Keep chickens/rabbits in good strong enclosures that are predator proof. I am a firm believer in the possibility of true coexistence with our wild neighbors. It's time now for a paradigm shift in the way we view predators; the recent science tells us so. It's time to look at the world and its inhabitants as a whole, with every action affecting a part of that whole, not as single, isolated, and disconnected features outside of ourselves. Why Prince Edward Island? Is probably the most frequent question I am asked. Prince Edward Island is a Vulpes vulpes gem. 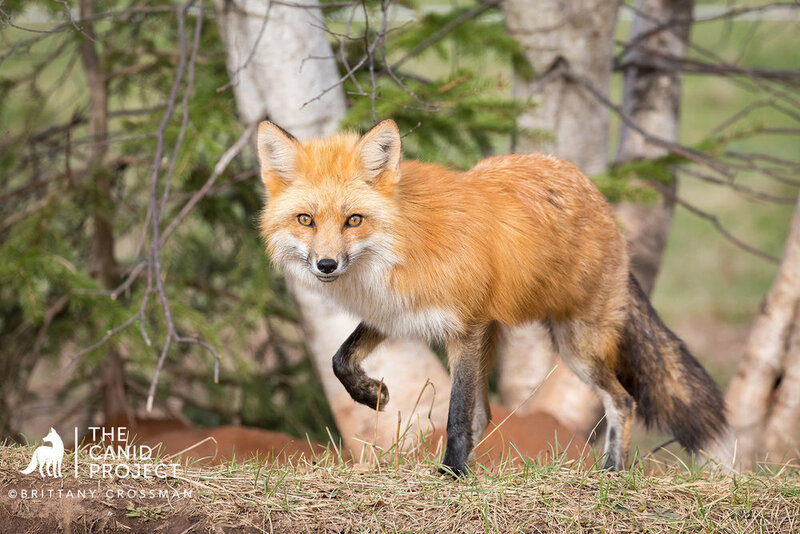 The island has a large, healthy urban red fox population, as well as many rural foxes that call places like PEI National Park home. These two options alone give a great variety of photographic opportunities, as well as learning experiences. 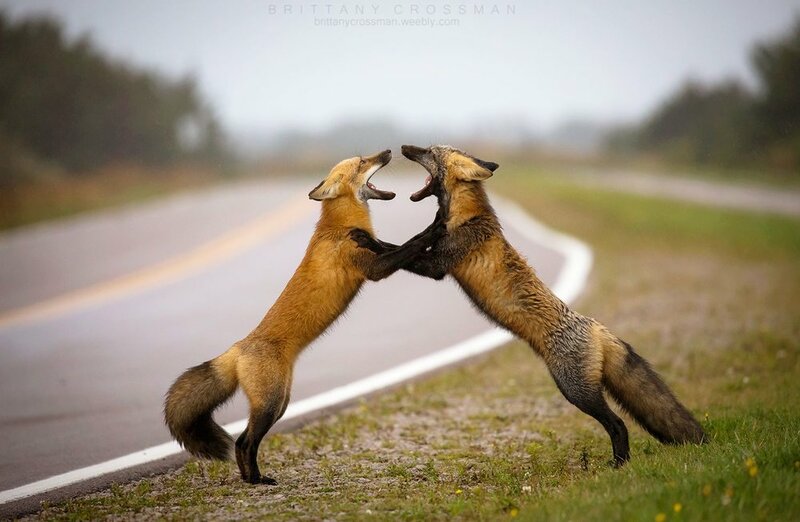 Foxes living in different environments, urban versus suburban, behave quite differently. 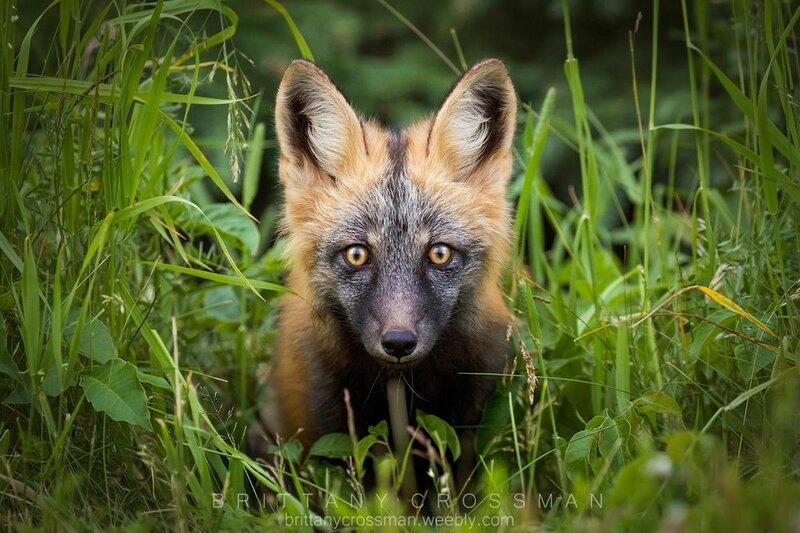 These differences make photographing the island foxes appealing. 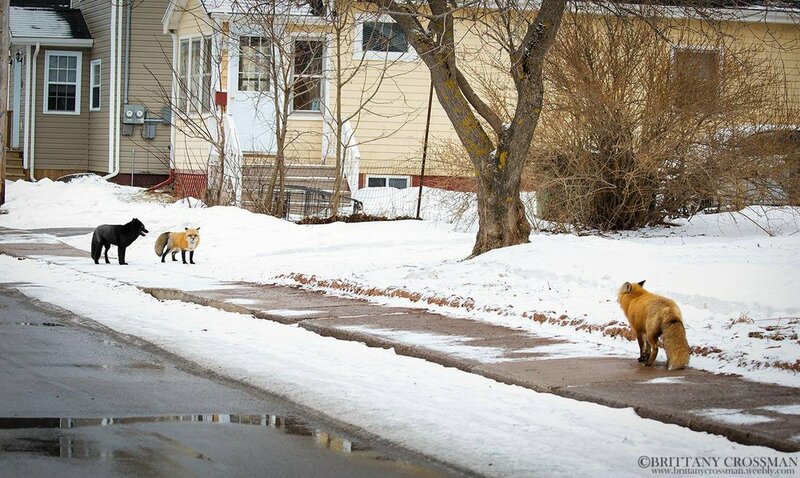 Another alluring aspect of PEI is the color variants of the foxes. 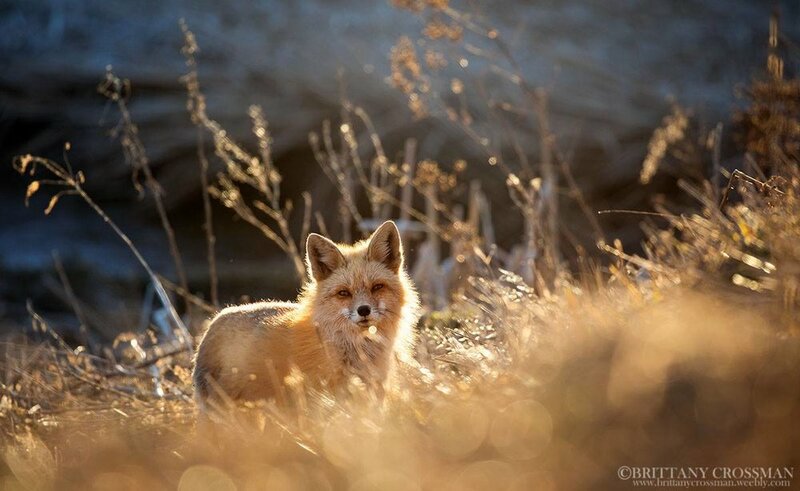 On the island, there are three red fox pelage colorations: red, cross, and silver. Red being the most common of the three. 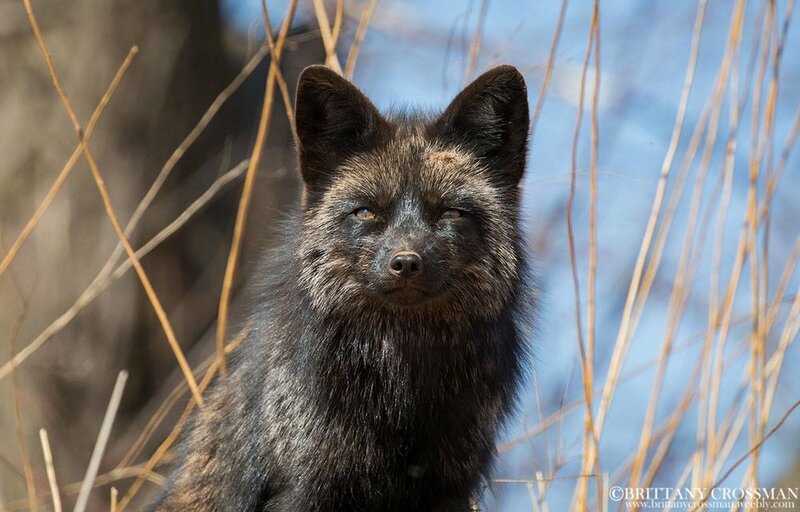 The cross fox is the red coloration with black marking due to being partially melanistic. This color phase gets its name from the long dark stripe running down its back, intersecting another stripe across the shoulders forming a cross. The most uncommon is the silver fox. 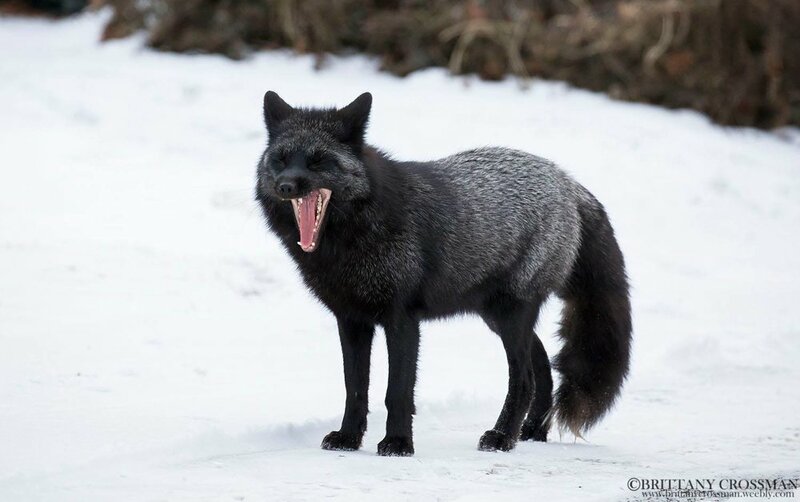 These foxes are complete melanistic variants (think of it as the opposite of albino) which gives them dark black fur. The name silver fox comes from the light greyish-white outer hairs. The amount of silver in these foxes varies from fox to fox. 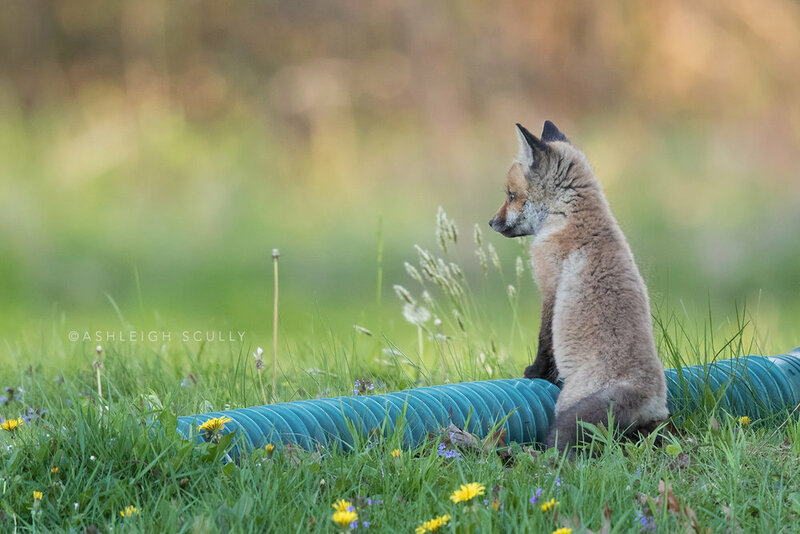 As a wildlife photographer, spring is always an exciting time as it is when animals start having their young. For me, this means fox kit season. 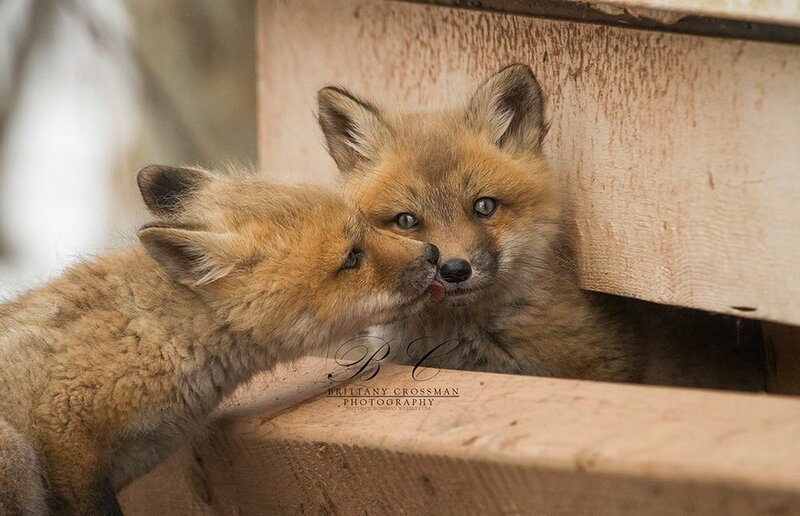 Red fox kits have become one of my favourite subjects to photograph due to their charisma, and playfulness. Watching their dedicated parents care for them is also very endearing. This spring I have been lucky to photograph two separate fox families. Both these families are unique, and have very different family dynamics. The first den has two red parents, and a third adult helper, which is no doubt the mother’s female kit from last year. These helper foxes are non-breeding vixens related to the family that stay back, contributing to the survival of the next generation. The mother and helper seem to do the majority of the work at this particular den. They both hunt, bringing back what seems like an endless buffet of rodents. The father fox usually isn’t far, always on the watch, but doesn’t seem to have much do with hunting and caring for the kits. He usually is in the nearby field curled up in a ball sleeping. When the mother brings back food, and starts to nurse the kits, the father fox comes for a quick visit, but typically takes food, trotting back out to the field. The other den has a silver father (dog) and a red mother (vixen). This den too has a helper fox, but, the role between the vixen and dog is almost 50/50. They rotate turns at the den and hunting. When the vixen gets back, the dog goes out to hunt. When he returns, then the vixen will leave again. The silver male at this den seems to have a never-ending amount of patience with his kits. Unfortunately, this family hasn’t been seen in the last little while; there are off-leash dogs in this area, which they didn’t seem overly fond of. I am hoping they just moved to another den location which isn’t uncommon for foxes to do if disrupted. When finding an active den in use, it is always very exciting, but important to give them space. If you ever find a den, keep a distance and let them get used to you. Once they no longer feel that you are a possible threat, the photographing opportunities are endless. *All images and text in this article are copyright Brittany Crossman and shall not be republished or reproduced in any fashion without the written consent of Brittany Crossman.